It is claimed though it has to be said without much actual evidence that we inherit the term "Upper Crust" from the fifteenth century when the aristocracy would be entitled to eat the superior or best part of the baked bread loaf or pastry pies whilst the ordinary folk were left with, in the words of Mary Berry and Paul Hollywood the dreaded soggy bottoms or overcooked dregs which sat nearest the fire. Whatever the origin a good crust can transform your dish and does not necessarily need to be a pastry fabrication. Crushed nuts work well particularly Pistachios mixed with bread crumbs and will lend a definite Moroccan, Middle Eastern or Persian accent to your lamb for example. Here at IF we are obsessive about not waisting food and that goes for stale bread as well, which last week we mentioned was useful for stuffing. The dried out odds and ends of loaves and baguettes make great breadcrumbs and will keep indefinitely. Just whizz the stale bread for a few seconds and you will have a very useful resource on hand in the cupboard with which you can coat almost anything. Mixed with Parmesan you can create the classic Wiener Schnitzel for example or chicken escalope. But we have found a particularly good candidate which will make fantastic and unusual crumb and will add interest to either fish or meat. The secret ingredient here is those little Wasabi peas which are usually served as a nibble with drinks. Simply place them in a blender and press the pulse button for a few short bursts. Add some bread crumbs and a couple of tablespoons of olive oil and mix and there you are. As simple as that. We generally use a little dijon or English mustard as "adhesive" but you can try beaten egg or just the egg white too. Simply brush on the glue and then apply the crumb generously and bake. 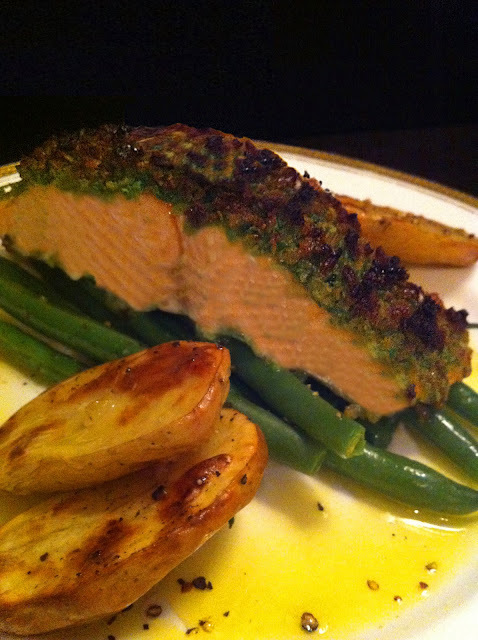 On Salmon for example the crust can be applied before any cooking and will have the added advantage, by virtue of protecting the fish from direct heat, of helping to keep it moist. The lamb dish pictured here is really delicious and definitely has that certain luxurious "wow" factor. It is one of the nicest and most delicate cuts of lamb and as such should always be served pink. The pistachio or Wasabi crust and "French trimmed" lamb look very impressive and your dinner guests will think you have spent hours in the kitchen. 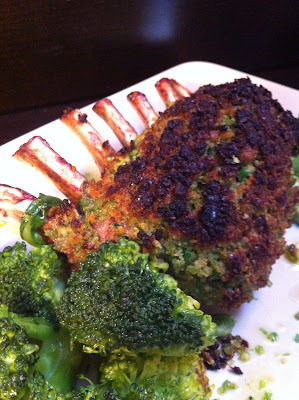 You can buy the rack of lamb already prepared and the crust takes just a few minutes to prepare. Each rack will serve two people. We suggest searing the meat quickly to seal in the juices and then coating it with the crust in advance and then holding it until you are nearly ready to eat. You can pop it in the oven for just over 20 minutes as your guests arrive and then allow it to rest whilst the starters are being served. Pre-heat oven to 180 C. To make the crust pulse the nuts or peas in the blender until blended but not too powder like. Combine in a bowl with the bread crumbs and oil and mix well. 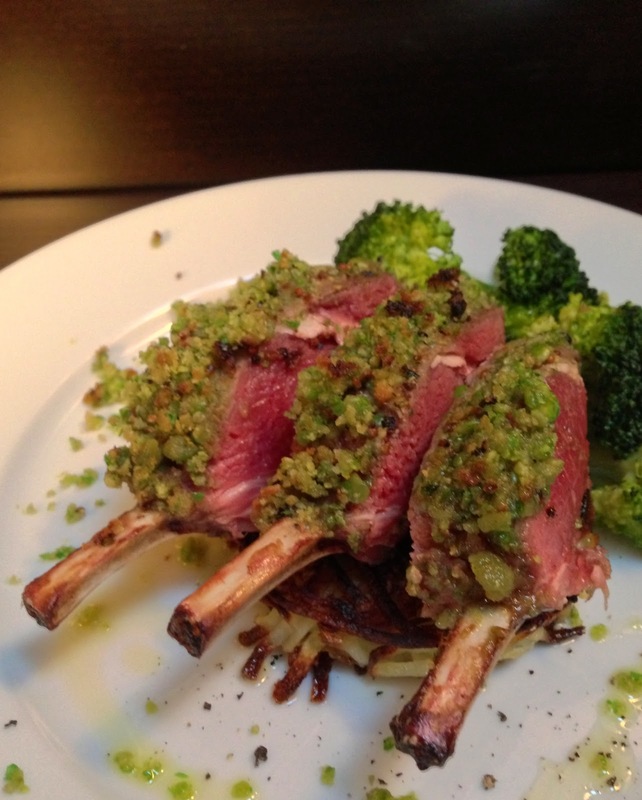 Remove any excess fat from the rack of lamb, season and place on a hot pan to brown all over. Remove from heat. Make an incision between each of the bones and brush with dijon mustard then cover the top of the rack with the crumb. Place on a roasting tray taking care that none of the crust falls onto the tray as this will burn. Place in the oven for about 22 - 25 minutes. Remove from heat and allow to rest for 10 minutes or more. To serve cut between the bones where the incisions were made earlier. Portion out on plates taking care that each serving is roughly similar.